Sugary sweets are part of Harvest time. Candy, gum, soda pop–they show up in trick or treat bags or school parties. How can parents and kids limit sugar consumption and still enjoy this fun time of year? Dr. Philip A. Baston, dentist in Columbia, suggests ways to hold the line on junk food and to keep smiles strong and healthy. Your Columbia dentist, Dr. Philip A. Batson, suggests some preventive strategies to keep kids’ teeth and gums healthy year ‘round. 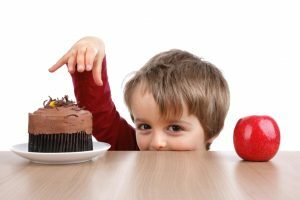 To deal with all those Autumn treats, work with children to limit how much sugar they consume. What’s the big deal? Sugar and starches form sticky biofilm on teeth and between teeth and at the gumline. Typically called plaque and tartar, biofilm contains bacteria which secrete acid that eats enamel and infects gum tissue. Unless removed by twice daily brushing and flossing, as well as six-month cleanings at Columbia Healthy Smiles, plaque leads to cavities and gum disease. Plan before you go trick or treating. Tell kids about how much candy they can collect, keep and eat. Tell them when they can eat it, too. Allow your children some candy. In other words, don’t go cold turkey on sweets. Have kids eat treats right after a meal and have them brush their teeth right away. Parents, model good behavior. Don’t overindulge. Don’t allow kids to “graze” treats between meals. If they eat some candy, have them brush and floss. If they eat treats away from home, advise them to rinse well with water. Control the candy supply by storing it out of sight. Tell kids they must ask for permission to eat sweets. Thin out the candy by keeping favorites only. Donate the balance to a local charity or even throw it away. Parents must set limits on behavior. If you tell your kids not to go outside after dark or run with scissors, you can tell them to eat less candy and cookies and more fruits, veggies and other tooth-friendly choices. Family dentist in Columbia, Dr. Philip Batson, and his dedicated team ask parents to bring kids for their first dental visits when baby teeth begin to erupt. These early visits are very simple and help kids with the regular cleanings and exams they need in toddlerhood, pre-school years and beyond. Digital X-rays image teeth and bone structure. Hygienic cleanings eliminate plaque and tartar and provide opportunity to teach kids about oral hygiene at home. Dr. Batson offers fluoride treatments and dental sealants to protect against decay. Just like Mom and Dad, children should see the dentist semi-annually. Regular visits catch problems early, preventing expensive treatments and sparing those baby teeth. The American Dental Association says baby teeth aid proper speech and oral cavity development and help the alignment of incoming adult teeth. Families can keep their teeth and gums healthy during the Harvest season. Dr. Batson is happy to help. Contact Columbia Healthy Smiles to set-up routine exams and cleaning appointments for you and your children.